Prairie Falcons are probably just as fast as Peregrine Falcons, but they do not dive from a high altitude to pursue prey. Prairie and Peregrine falcons are similar in size and can be distinguished from each other by color. The Prairie Falcon is brown and has dark patches under the wings. Juvenile Peregrine Falcons also have brown backs, but the adults are blue-gray and have a uniform underwing color pattern. Prairie Falcons are often used in the sport of falconry. 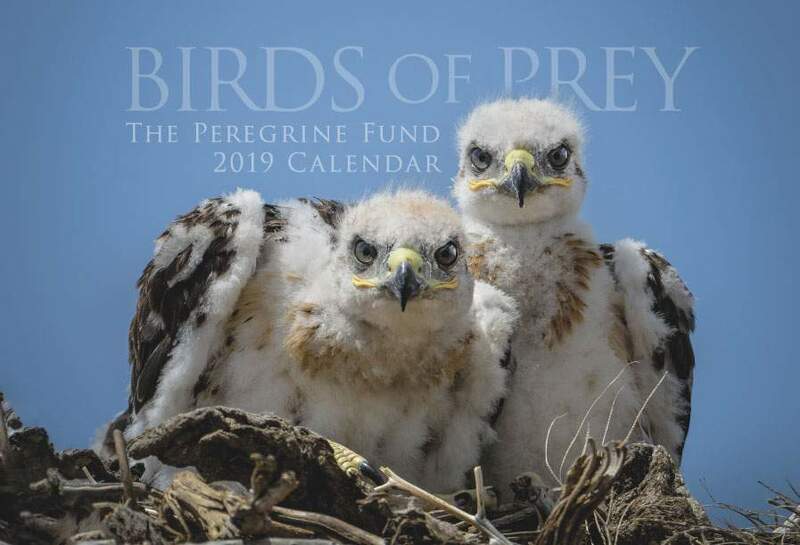 Though The Peregrine Fund doesn't work directly with Prairie Falcons, our efforts in scientific research, habitat conservation, education, and community development help conserve raptors on a global scale. We also supply literature to researchers from our avian research library, which helps scientists around the world gather and share important information on raptor conservation. Prairie Falcons have a relatively small range, compared to the Osprey, for example. However, their distribution still covers quite a large swath of North America. 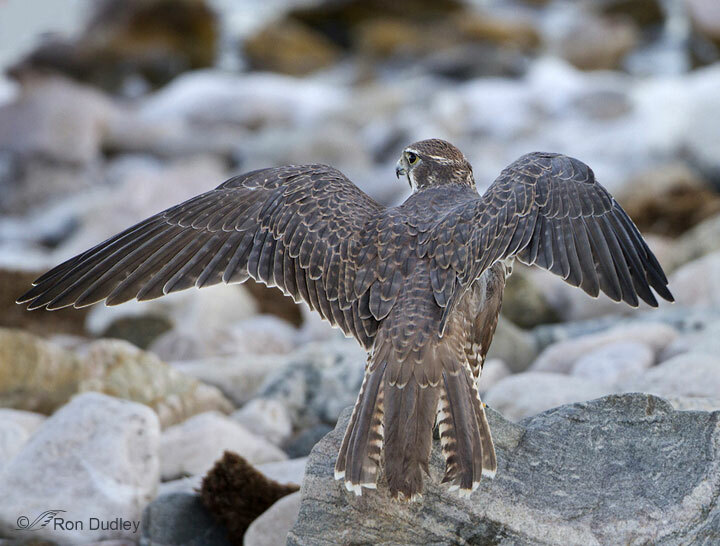 In Canada, these speedy falcons are present in south-central British Columbia, southern Alberta, and southern Saskatchewan. Their range continues south into the western United States from Washington east to western North Dakota and south into western and northern Texas. But the Prairie Falcon's distribution doesn't stop there. It can also be found in northern Mexico in areas such as Baja California Norte and from Chihuahua and Coahuila to Durango and northern San Luis Potosi. Though the Prairie Falcon doesn't participate in long distance migrations like the Swainson's Hawk does, it is considered to be a "partial migrant." This means that individuals will travel to higher or lower elevations, or to other nearby habitats, depending on food availability. True to its name, the Prairie Falcon occurs in open areas of all kinds, including plains, grasslands, steppes, deserts, and agricultural areas, especially where there are cliffs for nesting and roosting. The Prairie Falcon is a lovely, medium-sized raptor that has a grayish-brown back and a lighter breast mottled with dark streaks and dots. It is has some rufus on its thighs and bright yellow legs and cere. Would you believe us if we told you that one of its most unique facial features is its thin, dark moustache? Known by several names, including mostachial stripe or malar stripe, a bird's "moustache" is a line of feathers that extends downward from below its eyes or beak. Not all birds have malar stripes and those that do may have red ones, yellow ones, or most any other color. In Praire Falcons, the malar stripe is dark brown or black. Both the Peregrine Falcon and Prairie Falcon sport malar stripes, though the Prairie Falcon's is much thinner. 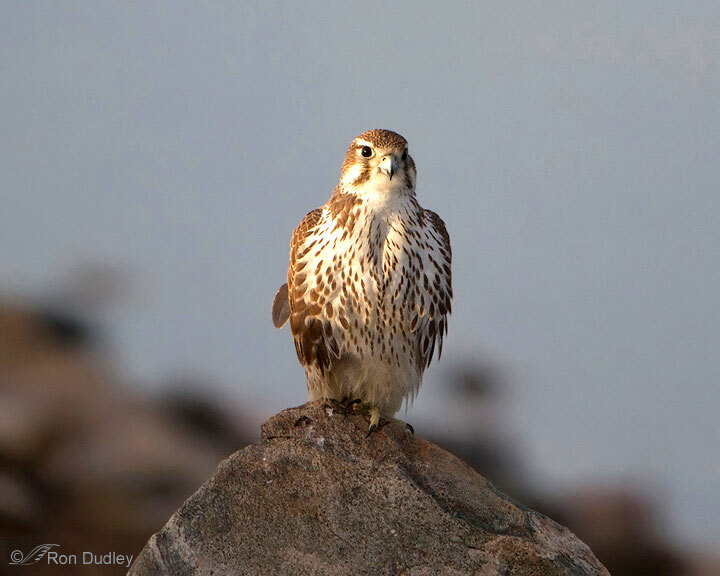 Like most falcon species, the female Prairie Falcon is much larger than the male. Though scientists aren't sure why this is so, several theories exist. One theory is that because the female generally spends the most time at the nest, she needs to be able to defend her eggs and young from potential predators. A larger bird would certainly be more intimidating! Another theory posits that males and females are different sizes so as to avoid competition between them for the same prey. A smaller male will generally be faster and more agile and so able to catch smaller, faster prey. The larger female, by the same reasoning, is able to take down larger, heartier prey. For now, Prairie Falcon populations appear to be stable, which means scientists aren't seeing large or notable drops in their numbers. However, they have seen declines in some specific areas, most likely because of urbanization, agricultural development, and other changes in how land is being used. Declines have been documented in Texas, California, and Alberta, Canada. If this pattern continues, it could lead to local extinctions. This means that Prairie Falcons might disappear from a certain state, province, region or other geographic area.Fewer Prairie Falcons and fewer suitable areas will eventually make it harder for individuals to find good habitat and new mates – which could spell trouble for the species in the future. 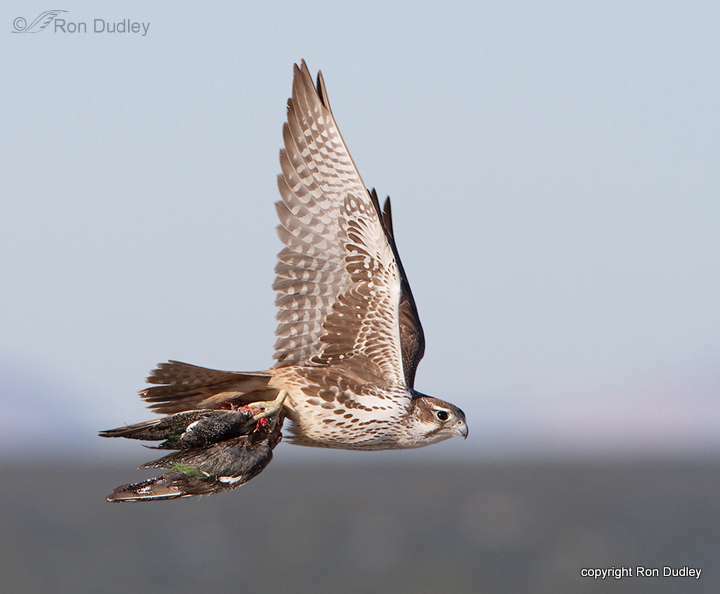 Though some falcons are predominantly bird eaters, the Prairie Falcon has a slightly more varied diet. This swift-flying raptor will indeed feed on many types of birds of many different sizes, including relatively small meadowlarks, tanagers and swallows, to bigger and bulkier prey such as chukars, pheasants, nighthawks, doves and quail. Prairie Falcons have even been known to prey on other raptors, such as Burrowing Owls! However, this falcon also consistently hunts small mammals, and in many areas, ground squirrels make up the bulk of its diet. Prairie Falcons also take kangaroo rats, packrats, and cottontail rabbits when the opportunity arises. They less commonly feed on lizards, such as horned lizards, whiptails, and collared lizards, as well as insects like grasshoppers and scorpions. The Prairie Falcon, like most raptors, is a keen hunter and therefore employs several different hunting strategies based on factors such as: what prey is being hunted, type of habitat, and maybe even weather conditions. The Prairie Falcon sometimes hunts from a perched position. 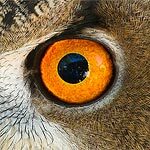 When it spots something it would like to eat, it drops low from the perch to pursue its intended prey. A Prairie Falcon also actively searches for food as it flies above its favorite hunting grounds, using its sharp eyesight to spot movement on the ground below. Prairie Falcons often catch prey on or close to the ground after an exciting high speed, low-angled swoop from above. Now that is a sight to see! Like most other falcons, Prairie Falcons do not build their own nests. 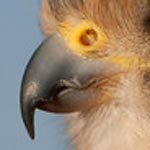 Instead, they nest on a ledge, cavity or crevice of a cliff face or they use abandoned nests of eagles, hawks, or ravens. The female lays 3-6 eggs, which are whitish with brown blotches. She waits until the last or second-to-last egg is laid before beginning to incubate. As in many falcon species, the female does the majority of the incubating, which means she must spend most of her days sitting on the eggs to help keep them warm. The eggs must be incubated for about 31 days. That is a long time to be sitting, and if the nest gets a lot of sun or rain, it can be uncomfortable for the female, as it is her job to protect her eggs from extreme weather and temperatures. Occassionally, she will stand up to turn her eggs so that the temperature remains even throughout each egg and so the embryo does not stick to the inner membrane. When it is time for her to eat or if she needs to take a break, the male will take over incubation duties for a relatively short period. But don't worry. The male is working hard, too. During this time, it is his job to provide all the food for himself, the female and for the chicks for the first couple of weeks afer they hatch. The male spends a lot of energy bringing in enough food for everyone. As you can imagine, growing chicks need a lot of food! Once the chicks hatch, the female still needs to brood them, or sit on them, to help keep them warm. At a young age, they are unable to thermoregulate on their own, which means they can't control their body temperature and can easily get too cold or too hot. After about two weeks, the chicks are able to thermoregulate and the female then begins helping with hunting duties. After hatching, the young spend another 5-6 weeks in the nest before taking their first flights. The parents continue to feed the fledglings until they learn to hunt on their own, which typically takes several more weeks. After that, they disperse and must be entirely self reliant, able to find food and evade predators without any help from their parents. Though they aren't common throughout most of the state, they can be seen in an area not far from The World Center for Birds of Prey. The Morley Nelson Snake River Birds of Prey National Conservation Area, near Kuna, Idaho, is a wonderful area to visit for any raptor enthusiast. 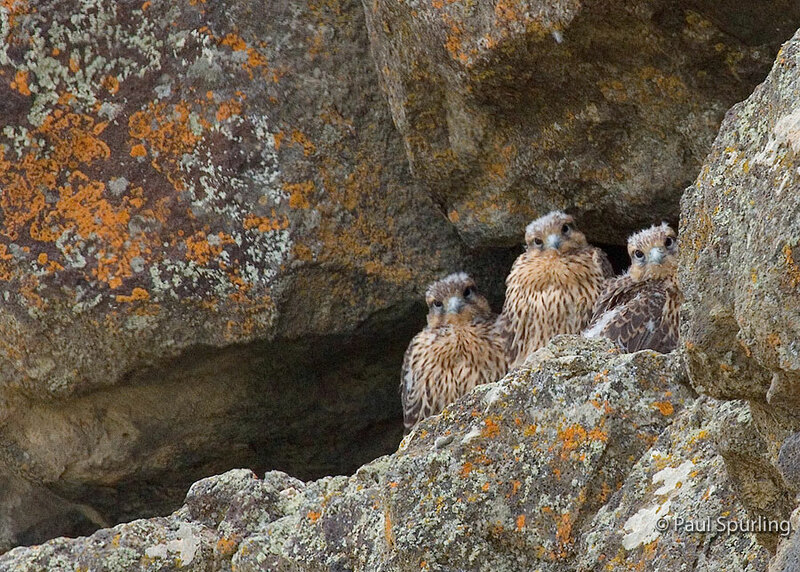 Here, among the sheer canyons, flowing river, and open plateau, you will find large concentrations of nesting raptors, including the lovely Prairie Falcon. In fact, according to the Idaho Fish and Game Department, this area holds the largest concentration of breeding Prairie Falcons with up to 200 pairs in only 80 miles of the Snake River Canyon! Prairie Falcons can sometimes be seen around The Peregrine Fund's World Center for Birds of Prey. Watch for them when walking our nature trail. An interpretive sign at the end of the trail teaches you how to identify a raptor based on its silhouette. In the Velma Morrison Interpretive Center, you can measure your "wingspan" and compare it to that of a Prairie Falcon in our display of raptor silhouettes. The visitor center also offers other fun ways to learn about birds of prey with interactive displays, tours, interesting videos and a children's room with activities from coloring sheets to quizzes to costumes and a touch table for the curious mind. We also have several different birds of prey on display year-around. Knowledgeable staff and volunteers are on hand to answer any questions you may have about Prairie Falcons or any other birds of prey.